These washing and drying tips for more efficient laundry make household chores a chance to show off your eco-consciousness! Did you know the average American household washes roughly 300 loads of laundry a year, and that during those loads over 90% of energy spent during a wash cycle is used just to heat the water? Seems like a pretty big deal, right? But it’s an easy solution: making a simple swap to cold water washing can eliminate 1,600 pounds of carbon dioxide annually by reducing the demand for hot water. With the exception of especially dirty items, cold water will clean your clothes just as well as hot, and almost all detergents are formulated to work in cold and warm water. In the market for a new washer? Make the most of each load with Energy Star washers. Newer, more efficient washers (and dryers) will use considerably less energy (about 25% less) and much less water (about 40% less). Best of all, you can reap the rewards each month with an average savings of $40. 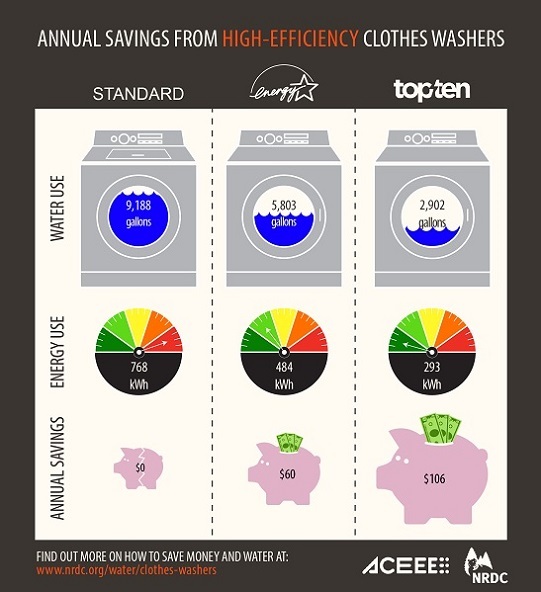 Other ways to reduce: wash full loads of laundry to maximize energy and water use. Be sure to check with state and federal rebates to see if you efficient washer can save you even more cashola. Here’s another green tip: if your gym clothes or towels have that special je ne sais quoi musty stank, add half cup of white vinegar along with your laundry soap to each load. It will eliminate the stink and work as a natural fabric softener too! And, don’t worry — the vinegar washes out, so you won’t smell like a pickle! The second step in greener laundry care is to reduce the amount of time needed for the dryer — or perhaps eliminate using it at all! You can keep your laundry vibe sparkling green by hanging your clothes to dry instead of using the machine. How much impact could it have? Dryers, all by their lonesome, use an average of 6% of total household energy. In California, an average dryer costs roughly between $0.35-$0.70 cents/hour for electric and $0.12 cents/hour for gas, which adds up quickly throughout the month, especially with a bigger household. 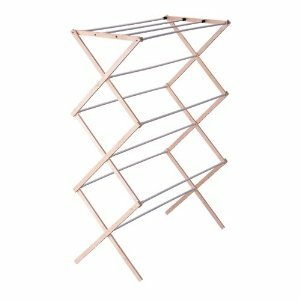 A better solution is to set up an indoor or outdoor clothesline, or invest in a small folding drying rack. Line drying your clothing not only reduces your energy costs, it also keeps your clothes in better shape for the long haul. Ever thought about what’s coming out of the lint trap? Those are teeny pieces of your clothes! And if hung properly, clothes will stay wrinkle free. And, if you have the advantage of strong sunlight, your whites will get naturally bleached. If your line-dried clothes don’t dry properly due to humid or rainy conditions and acquire that not-so-delightful musty smell, toss them into the dryer for 10 minutes on low heat with some plain old baking soda. Dry, fresh clothes will be yours! Keep your lint filter clean to increase efficiency. Always clean the filter before each load. Once a year, clean the entire dryer vent. Putting your dryer in a heated part of your house (instead of a garage or chilly basement) will help your dryer heat up with ease. Dry only full loads to get the most bang for your buck. Drying two or more loads in a row will help take you advantage of retained heat. Visit GE’s awesome Data Visualization Site to learn more about how much electricity your household appliances use.